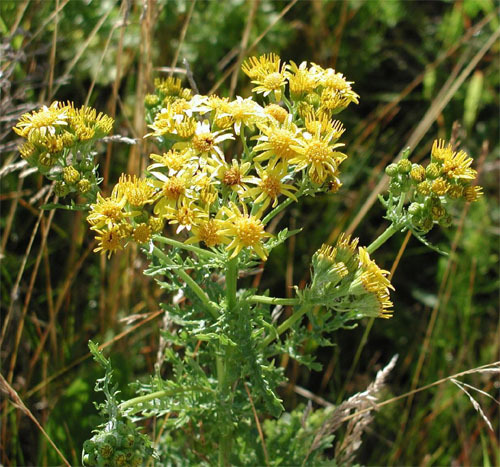 Tansy Ragwort is native to Europe, Asia and Siberia and is thought to have been introduced to Canada in the 1850s in ballast water of ships and as a medicinal herb. Since then, it has mostly spread as a hay contaminant. 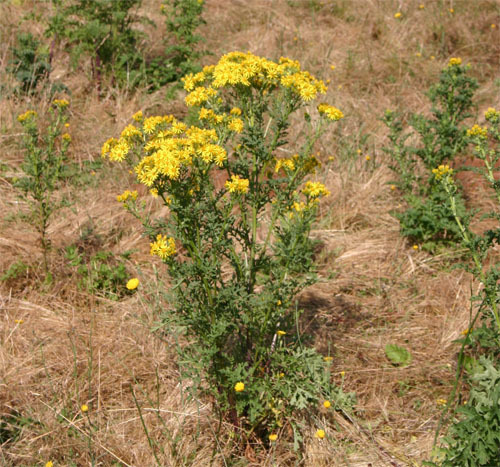 Tansy Ragwort invades disturbed sites, grassland, and open forest areas. It can significantly reduce pasture productivity. 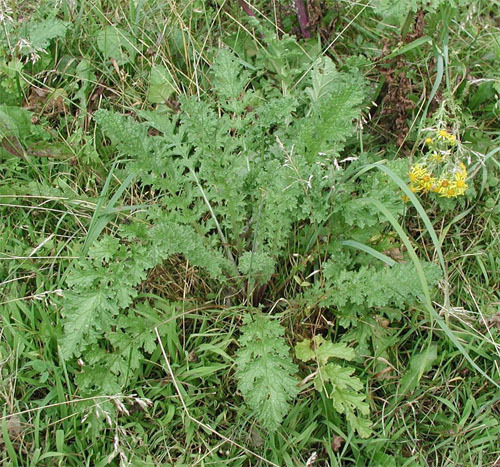 Alkaloids within the plant make it toxic to livestock, causing irreversible liver damage. Cattle and horses typically do not graze on it but it can be introduced into their diet by contaminating hay or silage. The flowers of this species are arranged in flat-topped clusters. The flowers have a yellow to orange centre surrounded by 10-15 longer petals. The bracts surrounding each flower head are black-tipped. The leaves are alternately arranged, green, deeply lobed, and a have a ruffled or ragged appearance. The stems are often purplish and grow up to 100 cm tall.